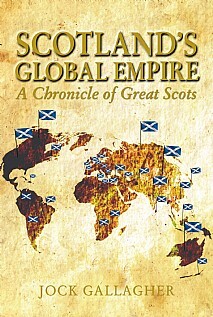 Scotland's Global Empire is one journalist's tribute to some of the lesser-known great Scots and their contribution to the world. Jock Gallagher was encouraged in his epic enterprise by a quote from Voltaire: We look to Scotland for all our ideas of civilisation. ‘Voltaire may have over-egged the pudding but in many areas, I believe, our small nation has punched well above its weight and has earned this generous compliment,’ says Gallagher. Is that a fine conceit, an extravagant claim or perhaps a journalist talking in headlines? You will have to read the book to find out! Written over five years, this engrossing and enlightening book stretches to over a quarter of a million words and is a fast, pacy read as it races through the exploits and achievements of an astonishing gallery of the Scots who make up his Scottish Empire. Although household names such as Andrew Carnegie, Alexander Graham Bell, John Logie Baird and Charles Rennie Mackintosh are mentioned to underpin the strength and breadth of the Empire, only abbreviated reminders of their well-known achievements are shown. It's not a recital of the adventures of conquering heroes, although some are included. It's more an outreach of ideas, the story of human endeavour in its many forms … pushing at the boundaries of the imagination and stretching the accepted order. It encompasses everything from the spirit of pioneering to the mystical qualities of leadership. Gallagher brings together an astonishing array of characters who may not have made headlines but are essential elements in his illusory empire with a heady mix of extraordinary vision, creativity, energy, leadership, diplomacy, skill, artistry, sometimes pure genius and, more often, downright doggedness. An unmissable read, particularly for all Scots, whether at home or part of the wider Scottish diaspora, as well as anyone with an interest in Scotland and its history. The diverse and perhaps unexpected contributions featured will amaze as well as entertain all readers.